Seville is always a popular choice for tourism in Spain due to its great history and many ancient buildings on display.Seville golf holidays offer sports and culture, allowing visitors to explore the city’s rich history and also get some golf in on their break. Seville is easily accessible due to the fact it has its own international airport. The region is situated in Andalucia and the golf courses in the region are all located to the south of the city, these are courses such as the Real Club de Golf Seville, Hato Verde Golf Course and Zaudin. The Real Club de Golf Seville has hosted the Spanish Open on the European Tour on many occasions and Irelands own Peter Lawrie was victorious here in 2008, we’re sure he would be highly complementary of the golf course! We have some great choices for accommodation in this great town with some of the AC Hotel and the NH Hotel branches, these chains know how to cater for guests and will ensure you get the most out of your trip and will be on hand for any advice you may need. Seville sits on the banks of the Guadalquivir River and as previously mentioned is one of the most historical places in Europe, you will not be short on places to visit or things to see during a sightseeing trip. Seville is known as one of the most charming cities in mainland Spain. 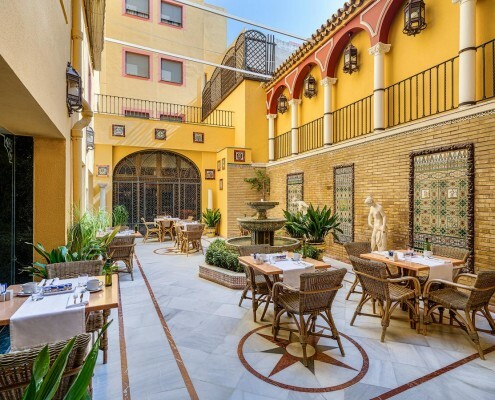 The bars and restaurants are renowned for their quality and offerings, you simply have to try some of the fantastic tapas restaurants during your Seville golf holidays, you will not be disappointed. Located in one of the Seville’s most emblematic residential areas next to the famous Avenida de la Palmera, this hotel exquisitely combines architectonic and aesthetic references from the early 20th Century with the modernist elegance of the present times. 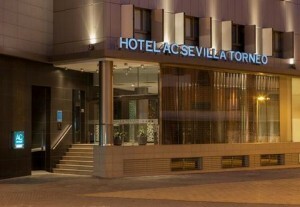 This urban, 81-room, hotel in Seville, Spain, is located on the SE-30 motorway allowing for easy access to the Nuevo Torneo business park, the Isla Magica Theme Park, the Cartuja Olympic Stadium, the Guadalquivir River, the Santa Justa train station, the forthcoming Line 3 Metro station, and the airport. 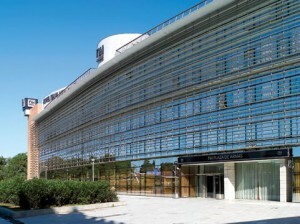 The NH Plaza de Armas Seville hotel is located along the banks of the Guadalquivir river in Seville, 200 meters from the bus station. You can walk to various attractions of the city such as the Museum of Fine Arts (5 minutes walk), the Cathedral, the Giralda tower and the Alcazar (10 minutes) and the Plaza de Toros and Torre del Oro (15 minutes). 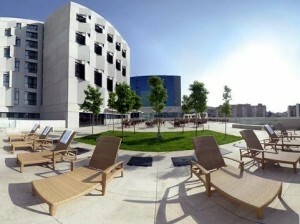 The Sevilla hotel NH Collection, formerly known as Central NH Convention in Seville, a prime location in the new “Golden Mile” of the city, just two metro stops or 15 minutes walk from the historic area. Within walking distance of the NH Collection Seville, you will find the shopping and entertainment district, which features the Nervion Plaza shopping center, El Corte Ingles and many other shops, cinemas, bars and restaurants. 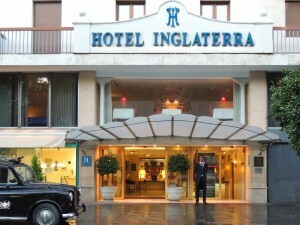 The Hotel Inglaterra, one splendid hotel in Sevilla Center, designed to ensure a unique stay for our guests. Just a few minutes away you can find the Seville Cathedral. The neighborhood of Santa Cruz is famous for its narrow streets, stately homes and beautiful squares, or the shopping area, full of shops, just a few meters from the hotel’s door. 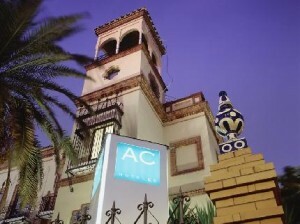 The H10 Corregidor Boutique hotel is located in the centre of Seville. The Boutique hotel is close to shops, bars and restaurants. It is a 10-minute walk from Seville’s Bellas Artes Museum. Seville is home to some of the best golf courses, which surround the town centre.